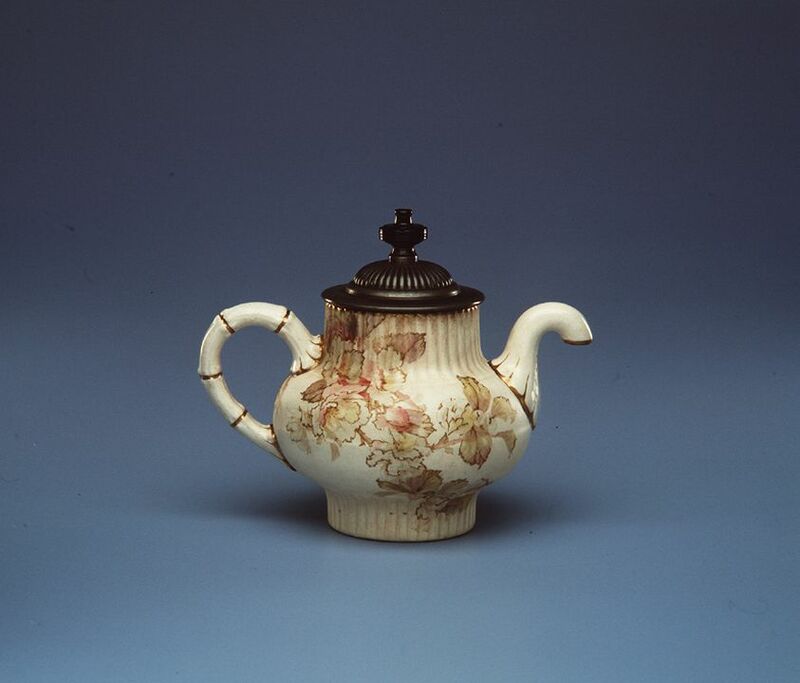 Ivory earthenware teapot, tall cylindrical base supporting a globular body with a tall cylindrical neck. Base and neck are fluted. Handle and spout moulded and edged with gold to resemble bamboo stalks. Neck, body and base are decorated with hand coloured transfer printed design of Australian wildflowers in green, pink and mauve with a gold outline. Silver plated lid has a domed gadrooned top surmounted by a black ceramic knop. Transfer printed mark in black on base 'ROYLES PATENT SELF POURING/No6327/1886/MANUFACTURED BY/ DOULTON'S/BURSLEM/FOR/J J ROYLE/MANCHESTER' and beneath it '307.102.25'. Impressed 'X'. Rectangular sticker 'B63'. Rectangular sticker '[ ] 804'.